Provided photo Guests enjoy “diner en blanc” — “dinner in white” — at a picnic party attended in Cincinnati by Tom Westfall, who is organizing a similar event in Piqua, to be held on Sunday, Sept. 2, at the Orrmont Estate. PIQUA — If you’re looking for a reason to wear white one last time before Labor Day, Tom Westfall has the perfect occasion for you. The director of choirs at Piqua High School has organized “A Night in White,” modeled after global picnic parties for which guests don their best dress whites for an evening of dining and dancing. Spanning six continents, diner en blanc — or “dinner in white” — events have been held all over the world, from Paris to Pittsburgh, and a plethora of points between. Westfall was inspired to bring one to Piqua after attending one last year in Cincinnati. After fits and starts in the planning process, he got the idea to plan “A Night in White” as a fundraiser for the PHS show choir, “The Company.” The event will begin with an hors d’oeuvre hour from 7-8 p.m. Sunday, Sept. 2, at the Orrmont Estate, 1612 S. Main St., Piqua. Tickets are $30 per person. Dinner — a picnic-style affair — will follow hors d’ouevres. Items that guests will bring include a picnic dinner, beverage of choice, and their own table settings. Table linens and napkins will be provided. For those who don’t wish to bring their own dinner, a boxed-dinner option is available for an added fee. A menu for the boxed dinners from TK’s BBQ-N-FIXINS also can be viewed on the website. “Janelle and Tim Baker, who own the Orrmont Estate, have two boys who are going to be in the (show choir) this coming fall, and they graciously, magically, amazingly granted us this space. After dinner, guests can kick up their feet to live music played by local band 24seven. In addition to visiting the website for “A Night in White,” learn more about similar events at dinerenblanc.com and on YouTube. 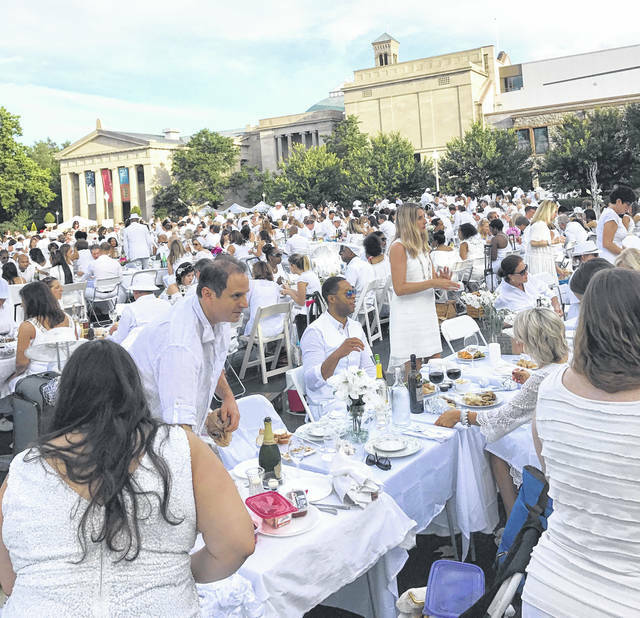 https://www.dailycall.com/wp-content/uploads/sites/30/2018/07/web1_picnic.jpgProvided photo Guests enjoy “diner en blanc” — “dinner in white” — at a picnic party attended in Cincinnati by Tom Westfall, who is organizing a similar event in Piqua, to be held on Sunday, Sept. 2, at the Orrmont Estate.